1. Prepare, Fix, Gear Up, Ready, Set, Set Up : تیار کرنا : (verb) make ready or suitable or equip in advance for a particular purpose or for some use, event, etc. 2. 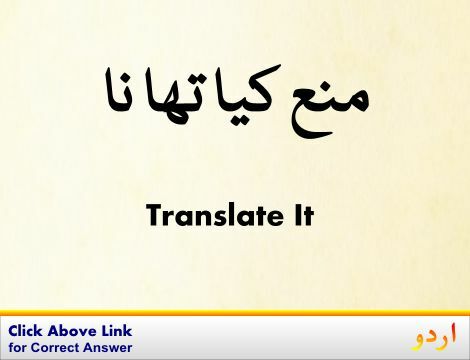 Prepare, Cook, Fix, Make, Ready : بنانا - پکانا : (verb) prepare for eating by applying heat. Put On - put on the stove or ready for cooking. 3. Prepare, Devise, Get Up, Machinate, Organise, Organize : سازش کرنا - خفیہ منصوبہ بنانا : (verb) arrange by systematic planning and united effort. Embattle - prepare for battle or conflict. 4. Prepare, Groom, Train : تربیت دینا : (verb) educate for a future role or function. Dispose, Qualify - make fit or prepared. 5. Prepare, Develop, Educate, Train : تربیت کرنا - تربیت دینا : (verb) create by training and teaching. 6. Prepare, Train : تربیت حاصل کرنا : (verb) undergo training or instruction in preparation for a particular role, function, or profession. Apprentice - be as a learner. Eating, Feeding : کھانے کا عمل : the act of consuming food. "You should have eaten it at home"
Equip, Fit, Fit Out, Outfit : کسی مقصد کے لئے لیس کرنا سامان دینا : provide with (something) usually for a specific purpose. "The expedition was equipped with proper clothing, food, and other necessities"
Preparedness : تیاری : the state of having been made ready or prepared for use or action (especially military action). Preoperative : عمل جراحی سے قبل : happening or done before and in preparation for a surgical operation. How this page explains Prepare ? It helps you understand the word Prepare with comprehensive detail, no other web page in our knowledge can explain Prepare better than this page. 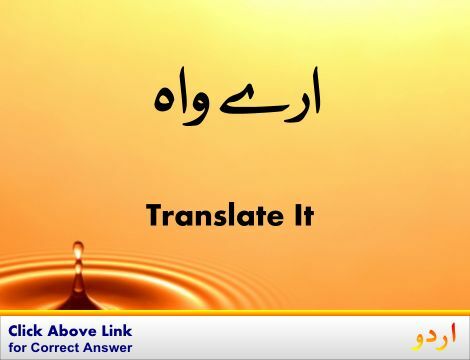 The page not only provides Urdu meaning of Prepare but also gives extensive definition in English language. The definition of Prepare is followed by practically usable example sentences which allow you to construct you own sentences based on it. You can also find multiple synonyms or similar words on the right of Prepare. All of this may seem less if you are unable to learn exact pronunciation of Prepare, so we have embedded mp3 recording of native Englishman, simply click on speaker icon and listen how English speaking people pronounce Prepare. We hope this page has helped you understand Prepare in detail, if you find any mistake on this page, please keep in mind that no human being can be perfect.